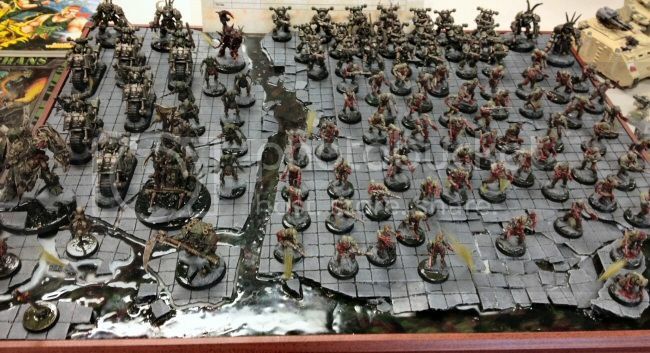 Post subject: Ultimate 40K 2012 aftermath! 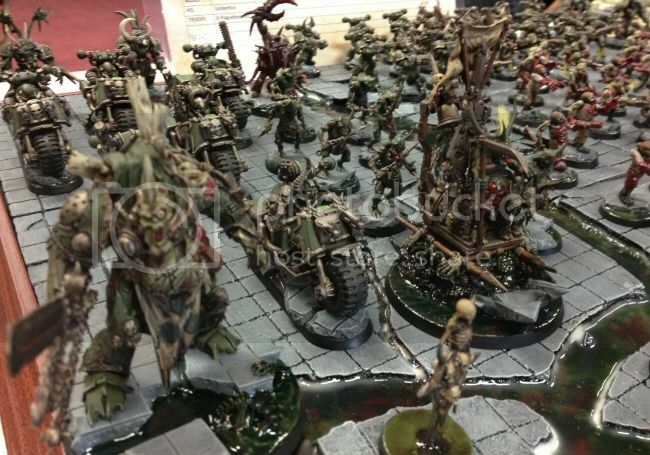 This thread is for post event discussion from the 2012 WestGamer Ultimate Warhammer 40,000 Tournament. Post any event feedback, experiences, battle reports or tales of glory and woe here! I'll post my own commentary in a little bit also. Full event results are available here! 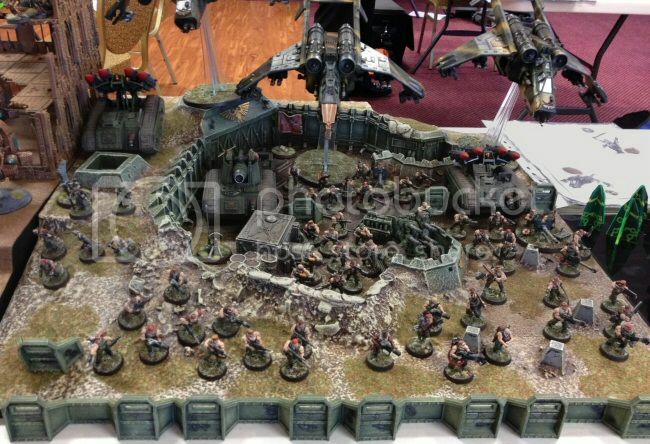 Post subject: Re: Ultimate 40K 2012 aftermath! "I'm on a drug called Charlie Sheen. It's not available because if you try it once, you will die. Your face will melt off and your children will weep over your exploded body." Mike took it out! I think he won by 1 point over Matt, not sure who came third. I got the one I wanted Ultimate Generalship, but was out-hobbied by Mike Basc to the tune of 1 point. 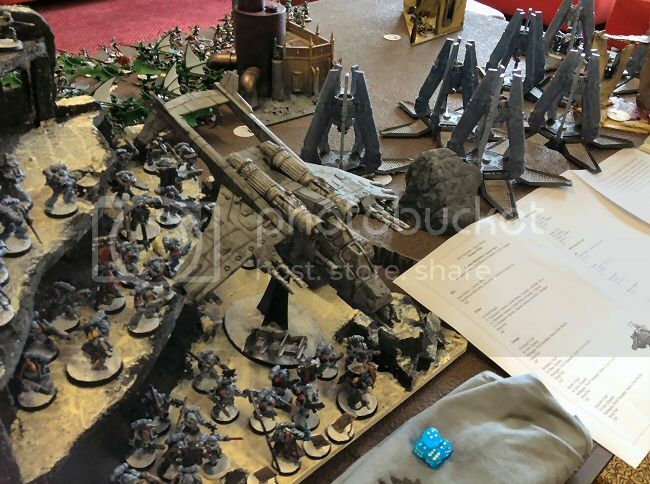 I'm not sure how the points break down, but I do know he made an exceptional effort this year with an entire multimedia display, storyboard and accessories as well as a fantastically painted army, and he absolutely deserved the award. I expect this means I had the highest generalship score (just because otherwise the gap would be more than 1 point lol), so we'll see when they're posted. Thanks to all my opponents for great games, but especially to the organisers who put in such a crazy amount of effort to keep this the premier event of the gaming calendar. How they ran 3 events concurrently and managed to have everything appear to go according to plan is beyond me - Well done Luke, Simmo, Adrian and anyone else who pitched in. This year i took my necron airforce to my 5th Ultimates invite. i was worried that i would be wiped out first turn and lose 20-0. But that never happened. Day 1 I had had 3 hours sleep and it really showed. I got a 17 win for my first game but as the day wore on and i got more tired i started making stupid mistakes which cost me my last game. When would dropping a scoring fast attack choice in front of a large unit of marine bikers lead by a captain seem like a good idea?! if i didnt do that it would have been another 17 win. literally was like a zombie last 2 games. Somehow i went to a halloween party and got home at 1am. looking at Luke I somehow felt a little better as with his blood shot eyes looked worse than me (so i hoped). Day 2 and with a massive 6 hours sleep i was ready to take on the day! pulled 3 20 wins by sticking to the objective and mission. I set up a lot better and was a lot better oppo. - the best army to destroy my airforce is another necron list. will put up 2 pics when i faced Olly. turn 2 my whole army was on the table as was his. next pic on turn 3 shows my 2 remaining units on the table legging it. - dont park an anni barge near a flyer as the flyer crashed and landed on the barge which exploded it. Look on Jasons face was priceless! 2 threats dead in 1 shot. - facing enemy necron MSS...that is bloody OP! - my flyers are fragile when they do get hit. Thanks alot luke, simmo, and adrian greatly appreciated. I've got some great pictures of some of the armies and games that I can post later, but here's my favourite beacuse it's the key moment from the one I lost. Matt was basically wiping the floor with me until his warlord chimera (a company command squad) rocked up. I instantly pounced on, blew it up, the four guys inside cowering behind the wreckage, apart from Darth Vader himself who poked his head up to survey the battlefield. He promptly lost his head to a tesla destructor (read matt failed a 2+ cover save) and I won the game 4-2 Victory points with the last shot of the last turn Matt was not impressed. (I believe darth vaders base may be shortened in the future) This is a game that by rights I should not have won. Haha yeah, I wasn't - talk about "Modelling for Disadvantage". That high scenic base cost me a game that had been running smooth as silk until that point. So here is a cautionary tale for all players about how easy it is to throw away a game where the warlord is worth three points. See where it all went wrong in the last shot of the game? Whaddya mean you can't see? OK here's a closer look at Vader popping his head up and saying "I think the shooting's stopped!" lol Matt. I think the shootings stopped! Here is my wrap/write up/feedback/thoughts after a much needed 8 hours sleep! 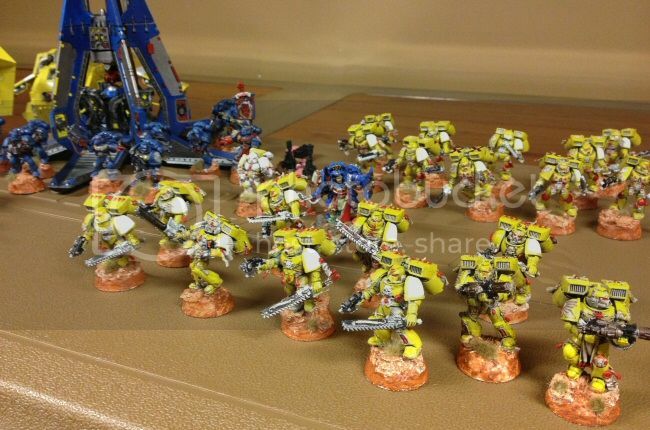 Infantry space marines! Hooray! This was a great match up for me with only long fangs to deal with to limit the fire back to my vehicles initially. Evan won the roll and went first, deploying very forward with the long fangs in a ruin. With pre-measure and night shields I deployed out of range of the long fangs and in cover with the beasts. Evans first turn managed a couple of dead beasts but otherwise nothing. I zoomed forward and poured fire into the long fangs, destroying them with venom fire. My lances nuked the rhinos and his force had to walk into my guns. His scouts caused some hair raising moments turn 2 but when I passed all my skimmer saves against his melta guns I think I had it in the bag. The scouts died to venoms and a wych charge while my beasts charged a grey hunter pack and while they did kill them all, they ended up being broken by the wolf lord and his unit. That said, come turn 5 all Evan had left was the wounded wolf lord and wounded priest in a ruin surrounded by dark eldar gunsâ€¦ and at the end of my turn 5 they were gone. 20 point win. More marines with light vehicles. He was just as fast so my nightshields would play less of a role though they did limit the initial turn or 2 of fire. Stupidly I forgot to deploy the beast pack this game at all so they had to come on via reserves, a move that cost me dear. Turn 1 I went first and took out the flamer speeder (flamer+DE = BAD) as well as a combat squad with plasma cannon and immobilised a AC razorback behind cover it could not see through. I also tried to take out the scouts but with go to ground they had a 2+ cover save so I could do little. At least the beasts could come on and get them as they had come right into my deployment zone (or so I thought). I took little in the way of return fire this turn thanks to the nightshields and went into turn 2 fairly confident. The beasts arrived and duly moved to 1â€ away from the scouts. The vehicles shuffled about to keep my distance. I started by firing into the scouts with the beast pack though I did not kill any after they went to ground again. I killed the second razorback and the sternguard piled out to be reduced to a single model after I kept shooting. Then a failed wych charge saw them left in the open and a gentle reminder you canâ€™t charge from reserve saw my beasts left high and dry as well. Neil played smart and poured on the pressure and I started losing things. The wyches died and the beasts managed to get pinned by the snap firing scouts. I lost vehicles here as well but not catastrophically. From here it see sawed back and forth with neith of us able to gain a distinct advantage. After 4 turns we ran out of time with neither of us gaining the primary objective (after some confusion about the way it was scored). I had first blood and neither of us had slay the warlord so I won on secondary though he did at that stage take tertiary from me. 15 point win. Bad. Very bad. My first battle with flyers. Looking at the deployment though, I was aiming for a tabling turn 1 as I only had 3 vehicles and a handful of infantry to kill. Kyle went first and advanced slightly with 1 venom lost and some minor damage to a ravager and spawned 2 scarabs. I responded and things died. I killed all the destroyers, left 2 scarabs alive along with a single spider. The command barge went down and the lord was wounded. I managed an 11â€ charge through cover to get the beasts into the annihilation barges and while I wrecked one I left the other with just a single hull point. A little more luck would have seen this plan work and kyle looked very worried if his planes did not show. As it stood he got all 4. Tesla arced everywhere and I lost a tonne of stuff. The beast pack took the brunt with 2 of the nightscythes, the wounded barge plus the deathmarks and 10 immortals with crypteks pouring fire into them to take them out. 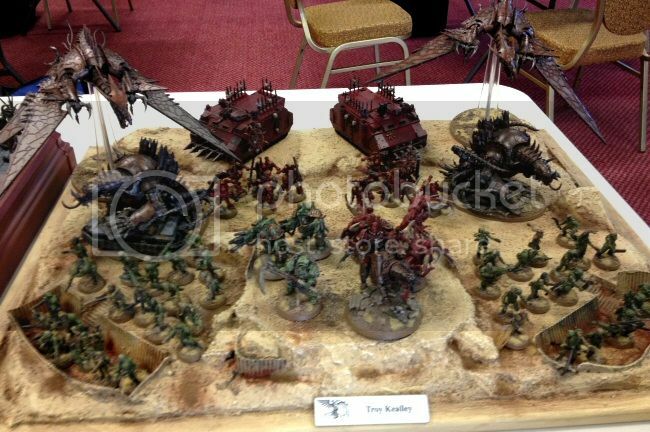 Then all of his infantry died â€“ venoms are awesome! This took kyle by surprise a little I think as the venoms took the next volley of death from the scythes. 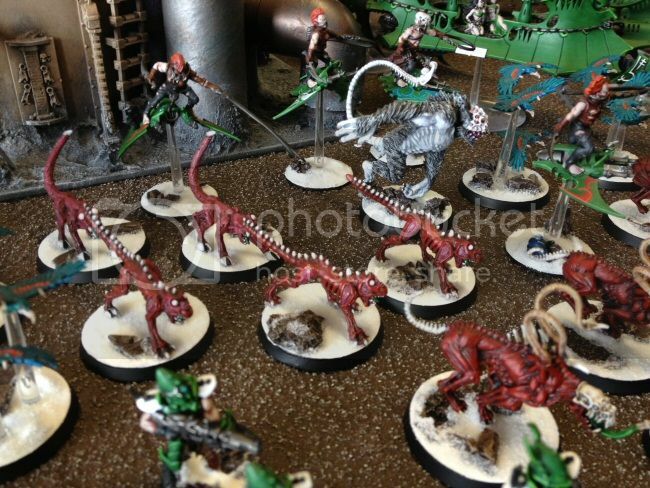 By now with the trueborn, their venoms and the baron all dead while the wounded necron lord had escaped in a now empty scythe the game was kyles. He already had 7 points while I had but one. Even taking out his lord and the deathmark flyer I would only manage a total of 5. At the end of turn 4 we ran out of time and while Kyle had the 4 planes left (1 had been glanced at least!) plus his lord in one, the rest of his forces was dead. I had a handful of models about the table but nothing to threaten the planes in any real way. Turn 5-6 would probably have seen me tabled. I did get 1 bonus point this round thoughâ€¦ 7 point loss. So end of day 1 I am 2 wins, 1 loss with 42 points out of a possible 60. Hmmm. Interesting. I won first turn but with blind deployment, most of the whole go second to see where the enemy is was lost and saw Tom deploy the 2 long fang packs and the Ig with psyker and nothing else waiting for the pods turn 1. I took out the exposed long fangs and was out of range of the others with all of the vehicles while the beasts took no damage from them. The pods landed and for the most part wiffed with only 2 vehicles downed. I poured fire into the wolves with the baron breaking away from the beasts to charge the long fangs while the beasts charged a pack of grey hunters. I did a bunch of damage but not enough. The beasts failed and broke from the hunters but the other units were punished badly by my guns. The wolves responded and again my saves and night shields held with more vehicles going down but the ravagers remaining. Come turn 5 we had very little left on the table and nothing on the primary objectives. I had slay the warlord and first blood giving me a win on secondary. The highlight of the game was 3 trueborn charging a mark of the wulfen marine and killing him to get the VP for the whole unit! 15 point win. We randomly deployed the objectives face down as per the mission and flipped them at the start of turn 1 after deploying. Luck smiled on me with 2, 3 and 4 on the objectives in my half while Brendan got 1, 2, 1. This in effect created â€˜the perfect stormâ€™ game. We knew that the match up was bad for Brendan from the get go with him having very little shooting and no real way to get the tally up for epedimus but the fact that the VP on the objectives was 9-4 before we moved a model or rolled a dice kind of ended this game before it started. In effect, all I had to do was not advance and let the horde walk into my guns. Which is essentially what happened. We had a few scary moments where Epedimus dropped into the middle of my army and then took the whole force shooting him and his 10 plague bearer mates only to live and have to be finished off by the baron in combat. The obliterators landed and both failed to destroy a target and all the while I was chipping away at the horde. Infact at the end of the game Brendan managed just 135vp from my army while I had destroyed nearly all of his. I will say he rolled like a boss for his FNP with plague marines shrugging of blaster and dark lance fire like it was not funny. Brendan took it all in his stride and played on valiantly despite what the outcome seemed to be. 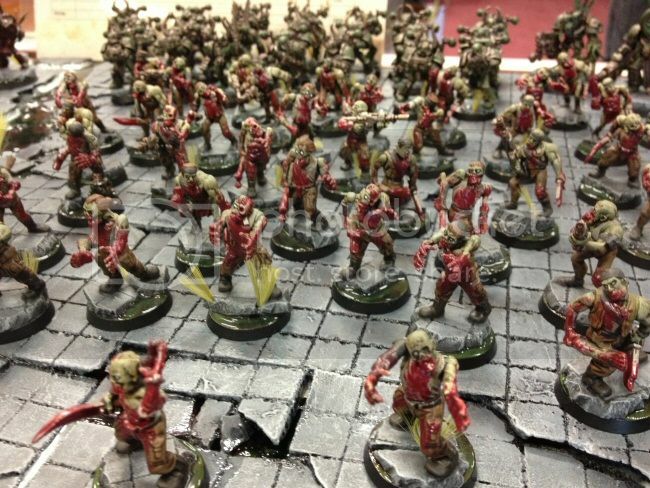 As one spectator quipped â€“ â€˜They survived the fall, a zombie apocalypse is nothing!â€™ 20 point win. 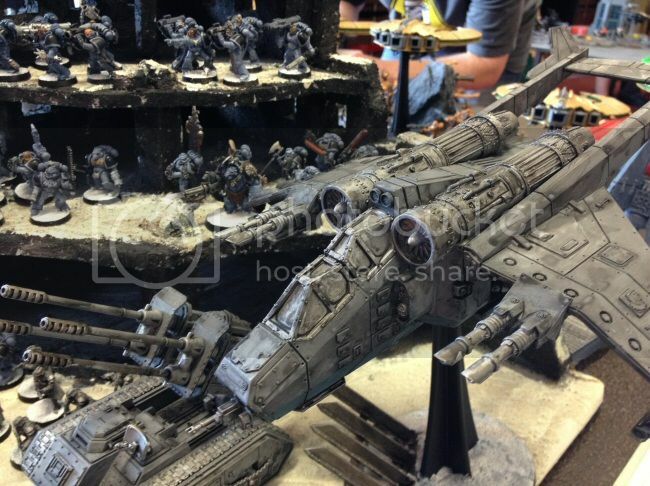 Lord on Barge, Destroyer lord, 6 wraiths, 3 annihilation barges, 5 warriors with lord, 5 warriors with lance cryptek, 3x6 warriors with haywire cryptek in night scythes. Well damn. 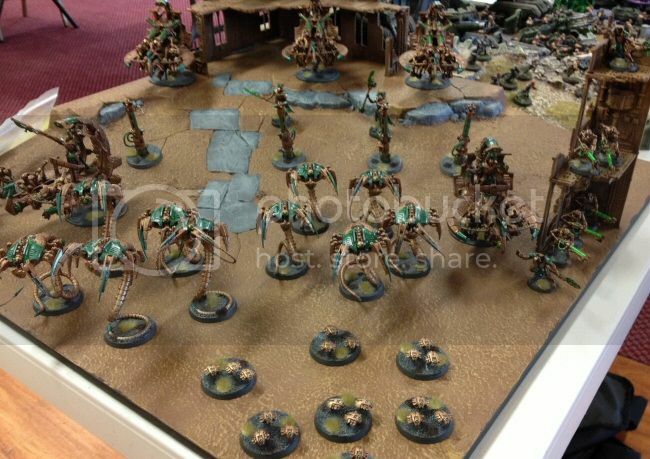 More necrons. The bane of dark eldar. Still, I had a plan. Turns out the warlord trait (-1 to enemy reserves) combined with the plan worked very well. 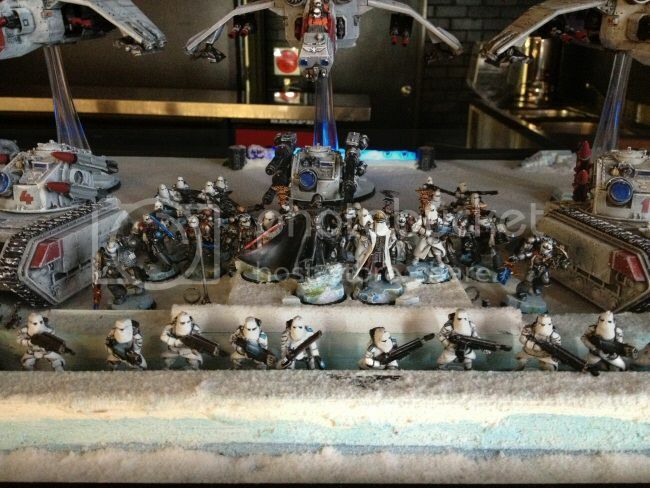 I went first and took out 1 of the annihilation barges along with a unit of warriors on foot with a lance cryptek. Not great but I had advanced a lot in this phase so that I could be well into his side of the board come flyer entry. I had also disembarked my unit of 8 warriors to capture a point which left them dangerously exposed to the wraiths. In his first turn, Olly wisely decided to kill those warriors with the wraiths but after I goaded him a lot about how the beasts would win combat even when charged by the wraiths, he decided to charge them instead. I lost badly to say the least but then proceeded to roll double one and hold! Combine with hit and run and woo hoo! This left the wraiths high and dry in front of some 80 odd poison shots which work very well against things like wraiths. The beast pack got to eat another 12 odd warriors over the course of the game to finally do something good for the weekend and while I lost all of my ravagers, I was still in a strong place at the end of turn 4 when time was called. With just 3 necron warriors, a lord on foot, a destroyer lord who had stood back up and the 3 planes vs multiple blasters and infantry, I am confident the final outcome would not have changed with 1-2 more turns. By removing those small units of warriors as soon as they hit the table and then retaking the objectives I was able to ensure I had the game as he simply could not unflag the objectives I had taken. 20 point win. I have to apologise to Olly though as well â€“ there were a couple of times he had to say the same thing like 5 times because I simply did not understand what he meant! Sleep deprivation after 2 days of gaming meant some (in hindsight) very simple concepts were completely lost on me at the time â€“ sorry mate! So I finished up with 97 points from the 120 available and 5 wins, 1 loss. 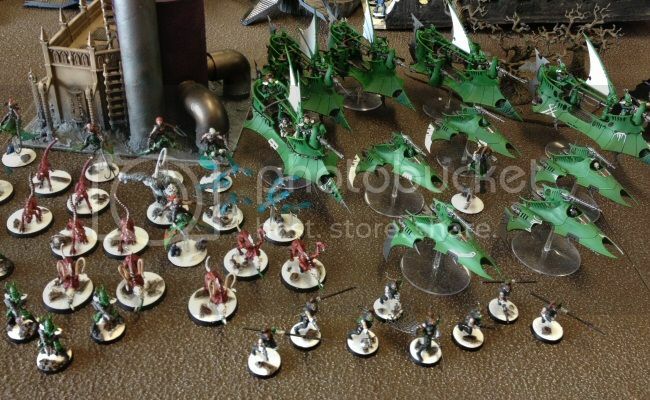 I was really pleased with this as dark eldar certainly seemed like the underdogs to take in a sea of necrons, guard and marines but with the change in meta to more infantry and less tanks, the volume of fire a dark eldar army can produce now is a serious threat! Combined with pre measuring and night shields meant I could dictate a large amount of the incoming fire and get to shoot first in a lot of cases. I think my plan of being too close for the flyers is a sound one â€“ especially against necrons. It did not work in game 3 as I was simply not able to engage quickly enough to get them to overshoot me â€“ he went first and the deployment (hammer and anvil) means I could not get over quick enough. I took option B and tried to wipe Kyle outâ€¦ which while an ok plan did not quite work. In game 6 it worked very well! 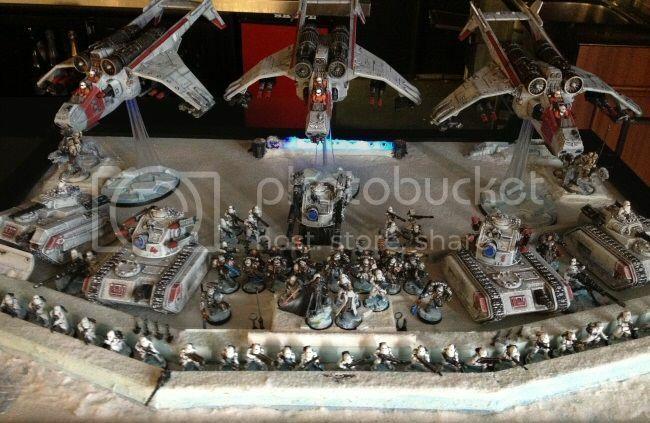 I still need more time on the table playing against flyers to make up my mind but I donâ€™t think they are essential to all armies in a competitive environment. I was very happy to get Best Hobby again this year, and to get second place for generalship was great as well. To get best overall was fantastic â€“ especially as the competition is so fierce. I would like to thank each of my opponents as they all played very well and were great to play against. To the TOâ€™s, a massive thank you and congratulations on running the 3 events at one time with such success. I know firsthand how much work goes into running an event so 3 at once is massive. Luke in particular deserves praise for the time and dedication to running this every year alongside his various other commitments and his very understanding wife! 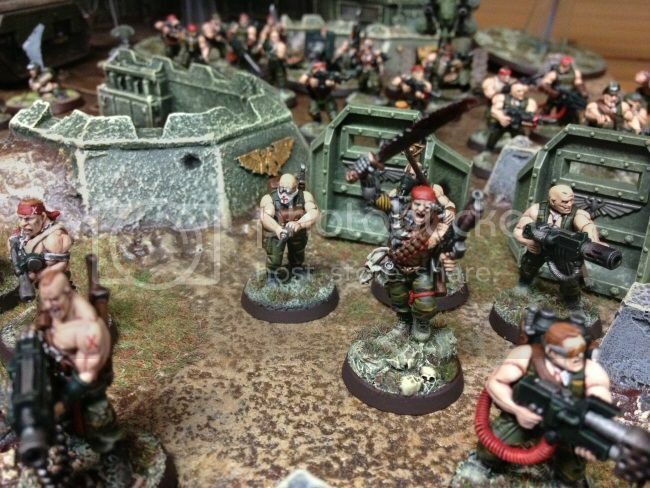 Here are some photos I took of some of the fantastic armies from the weekend's event. These are were just taken with my iPhone so may not quite do the level of detail on some of thes models justice, but I expect a lot of people will enjoy seeing what the players were working on in the weeks up to the event. 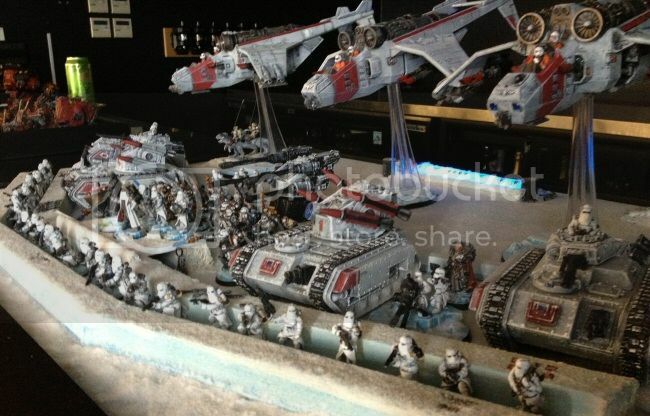 Look at Darth Vader, standing so proud on his Scenic Base. The Force wielding metachlorian enhanced bantha pudu. I'll get the score breakdowns up as soon as humanly possible guys - just forced to catch up on some real life stuff first. It should be Thursday night at the absolute latest. Wow what a weekend, i played 6 great games, won 4 and lost 2, the games i lost really could have been wins. All my opponents were great, Pete, Barry, Neil, Adam and Tyson but I think by far the highlight of the weekend for me was the game against Mike's Dark Eldar, game was pretty much: I roll bucket of dice, he removes half of army, he rolls bucket of dice, i remove half of army. My Tesla was incredibly destructive this game and i have a new respect for splinter weapons. Simply put my army just didn't have enough long range firepower to stop my assault army being shot to pieces. On the positive side - the games weren't complete disasters; it just took too long for my hard hitters to get in and start smashing stuff! That and my Lord turning into spawn in 3 out of 5 rolls on the boon table. And generally early in the game too. Awesome. Not! (Brendan did experience this too - with Typhus managing to disappoint the gods in at least one of his games - however in our match up of course he managed to have his biker sergeant turn into a Daemon Prince!) Lets put it this way - as an OK player with not the best list what I needed was luck - but I had very little of that! At the end of the day though it was a great tournament and I got the best lineup of players I could hope for. Plenty of things I learned along the way and was a good chance to glean some tips from the top players. Thanks to the organisers for a great weekend and again for the Wildcard entry. Full event results are now available here!